I was going out to fill our bird feeders one morning and had to walk down two steps on our deck. I placed my foot on the last step and well....it hurts when you fall! Fortunately, I survived with only a few bruises but was sore for several days. Too many times we neglect to pay attention to the small things that can have real consequences, like changing the batteries in your smoke alarms. Same goes for ensuring your family's or visitors' safety on steps. Seems like one, two, or three steps shouldn't be an issue. But they surely can be. But How Many Steps Does It Take? I've often asked people, "How many steps does it take on which to fall"? What If Building Codes Say You Don't Need Handrails? 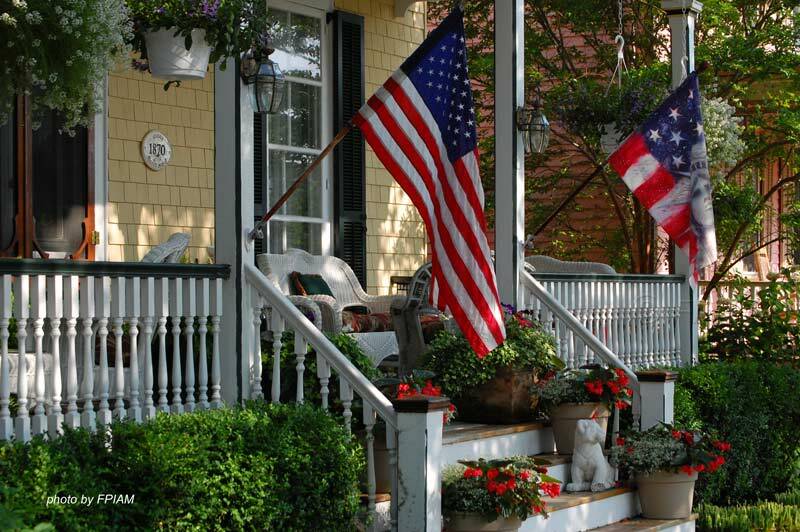 Building codes regulate the necessity for porch or deck handrails. Normally handrails are only required if you have four steps or more or if your steps are of a certain height. But, you can just as easily fall navigating only 1, 2, or 3 steps. So even if building codes don't require you to have handrails, they can still be a good measure to take. 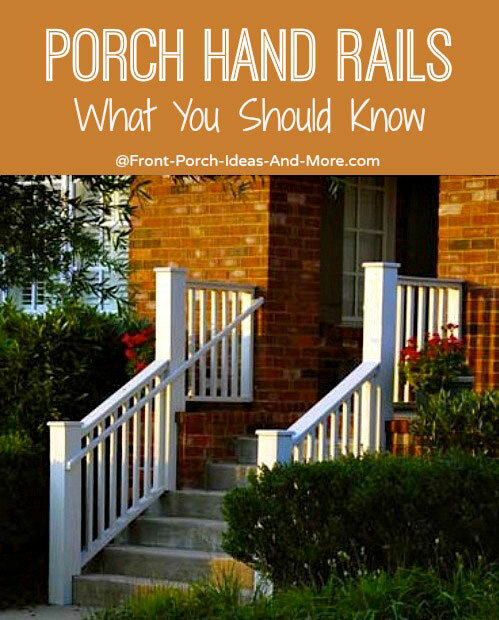 No matter the number or height of your steps, knowing the basic requirements and options for building both porch hand rails and deck hand rails can save you both time, money, and more importantly injuries. 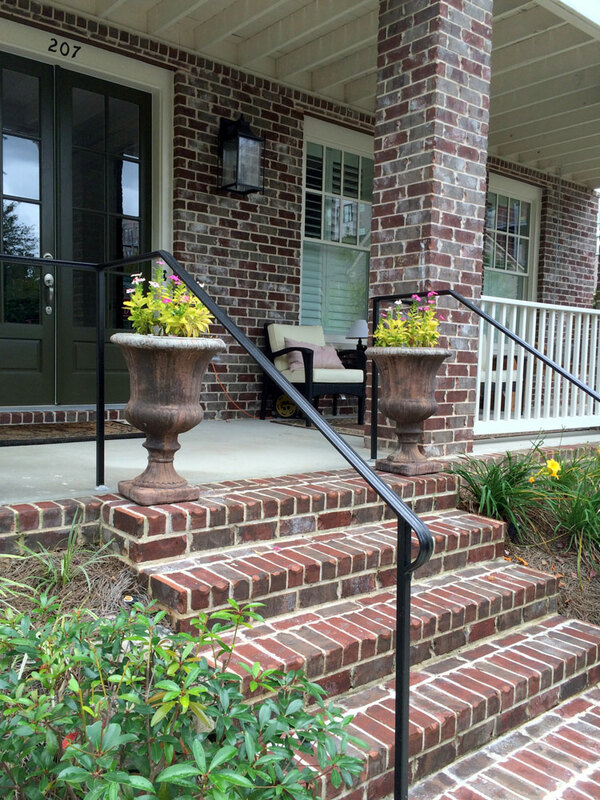 Outdoor hand rails can be made from materials such as wood, composites, wrought iron, metal, and aluminum. Aluminum handrails are extremely popular as they not only provide safety but also are very versatile and aesthetically pleasing. 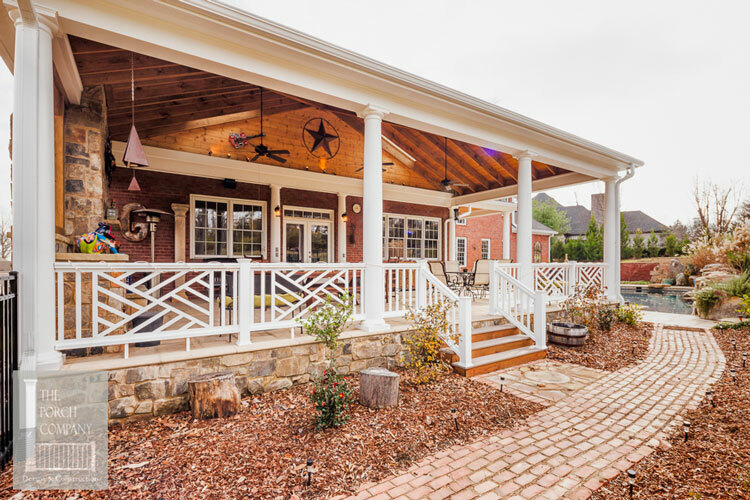 Typically, metal porch hand rails and safety handrail systems are made from extruded aluminum and specifically coated to ensure longevity with minimal maintenance. 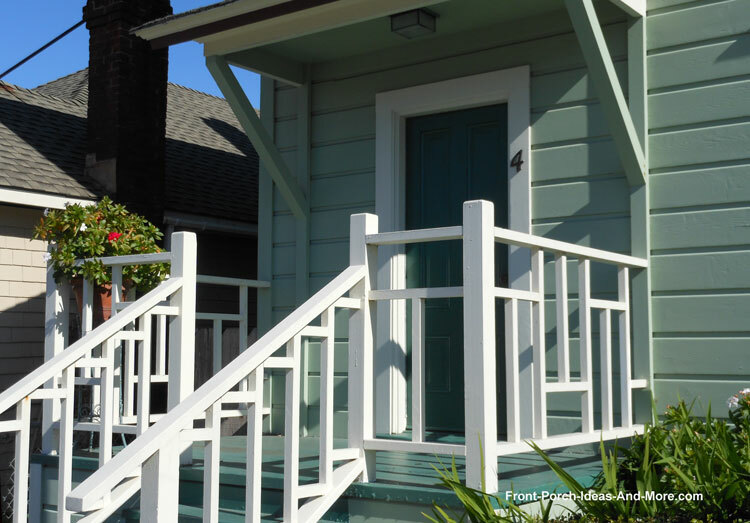 Unlike wood stair hand rails, aluminum porch hand rails can be easily installed making them a perfect DIY project. Now you can ensure the safety of family members and visitors by installing them anywhere someone might fall, whether you have only two steps or twenty. Did You Know You Can Get These Online? You wouldn't hesitate to replace a broken seat belt assembly in your car to protect loved ones. That would cost over $400 for parts and labor (based on a 2018 cost estimate for a Dodge Caravan). Hopefully, you'll never actually need it but you would thank your lucky stars if you did. 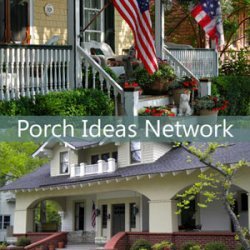 Porch handrails are much the same in that an investment of less than the cost of a seat belt, you can not only prevent injury but expensive medical bills as well. Remember, it only takes a slip on one step to fall. 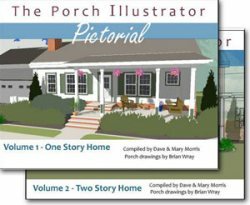 Some of our readers have purchased these DIY kits to install on their porches, stoops, or decks. Perfect for those who want to save on installation fees, these aluminum railings are suitable for one to five steps. 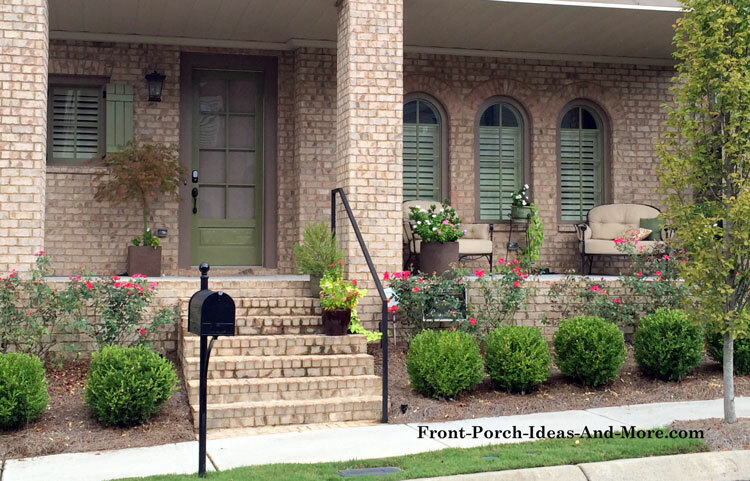 No need to cut, weld, or bend, as these metal porch hand rails move to fit almost any slope making them a breeze to install. You can install them on concrete or wood too making them ideal for decks. Easy Installation Too - You Can Do It! The slope is adjustable from 0 to 38 degrees and InstantRails are designed to fit the rise of most steps. Kits normally include all necessary assembly and installation hardware. 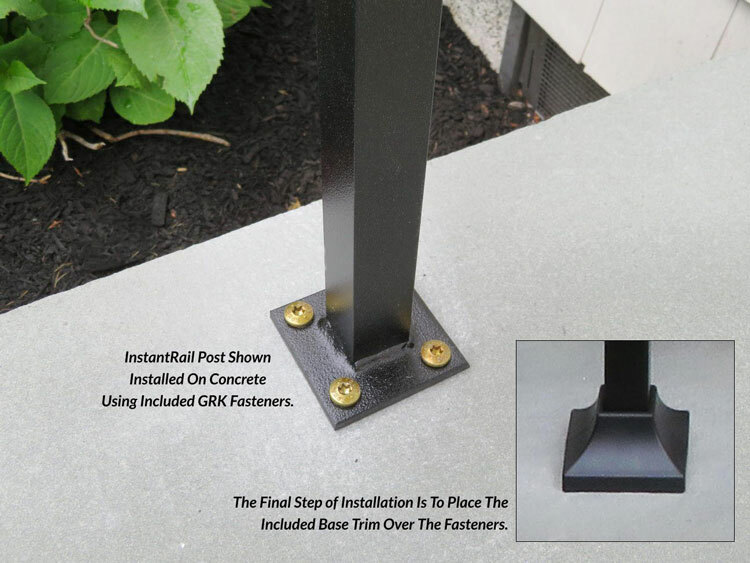 Installation is simple using fasteners provided or purchase anchor screws separately. A hammer drill is recommended to drill holes in concrete which can be purchased or rented at your local home supply store. 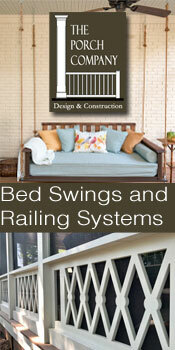 Or, if you prefer, you can acquire the services of a reputable contractor or handy-person to install the railings. 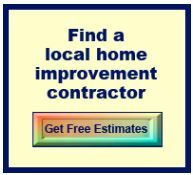 You an locate a contractor in your area here. Creative way to add safety in long step runs like the one shown below and are perfect for especially those who live where ice and snow are prevalent. 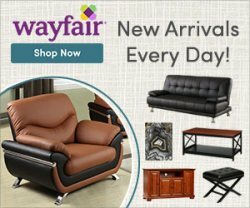 What About PVC or Vinyl Hand Rails? If you want low maintenance and durability consider PVC or vinyl hand rail systems. 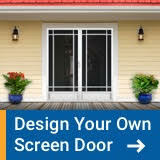 They are also very popular and fairly easy to install. 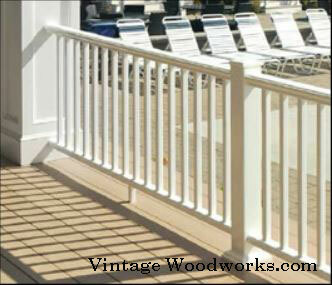 Most PVC railing systems have wood or metal inserts. Vinyl railings usually do not. Most kits come with everything you need, top and bottom rails, pickets, and mounting brackets. Often times they are pre cut to save time and for easier installation. They advertise their kits are designed for standard sized steps (7" to 11" rise to run) and include adjustable step adapters which are used to adjust for various angles. 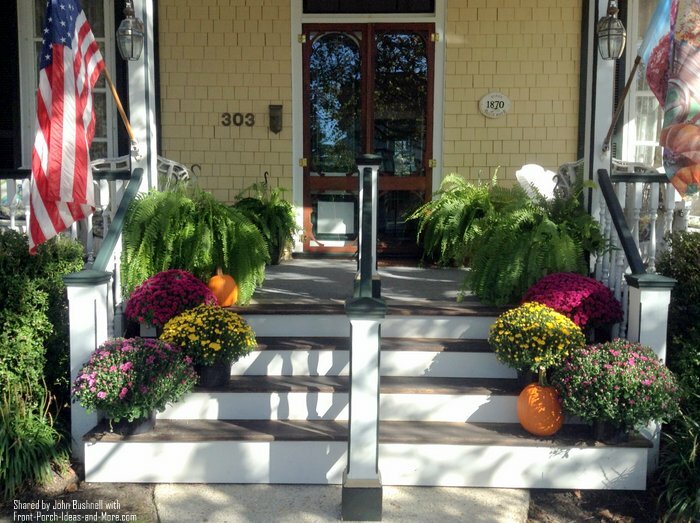 This beautiful porch in Cape May, New Jersey has wide porch steps and the homeowners like to decorate with seasonal potted flowers. But they told us that it was difficult for their neighbors to navigate the steps. So they decided to add a middle handrail. The homeowners hired a carpenter and asked that he make the middle handrail look as it if belonged there. What a wonderful job he did. 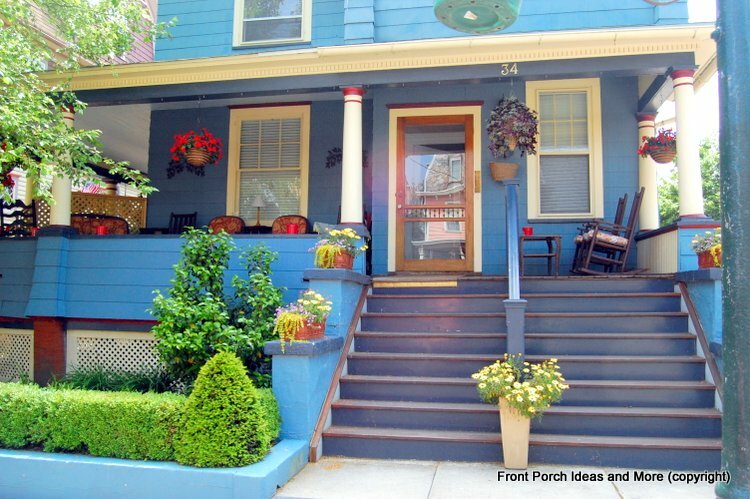 Do you agree that it looks like it's always been a part of these porch steps? And what a help for visitors. Now the plants can be kept on the steps and guests can safely navigate too. To give you a view of the steps straight on - looks absolutely perfect. We thank John and his wife for sharing their photos and story with us. Composites are another option you might want to consider. Composite materials last longer than wood and are maintenance free. 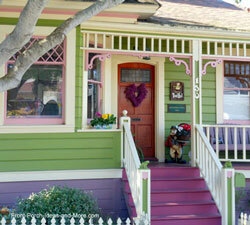 They have the look and feel of wood, never need painting, and are resistant to fading. 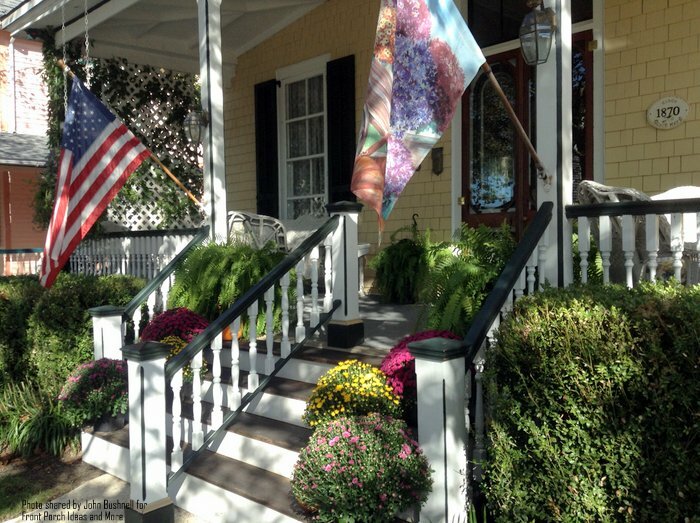 Learn more about composite step and porch railings at Vintage Woodworks. 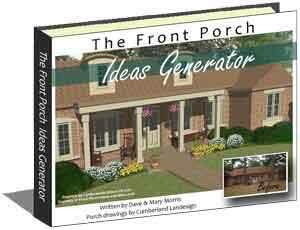 Still the most popular front porch and deck hand rail system, wood can be as simple or as ornate as you would like. I've constructed several wood hand rails and can attest the trickiest part is finding the correct angle for cuts. Once that's done, assembly is fairly easy given you can use prefabricated wooden top and bottom rails (available at home supply stores). Pickets fit into pre-cut holes making it a simple job. Wrought iron railings add sophistication and unique element of design. 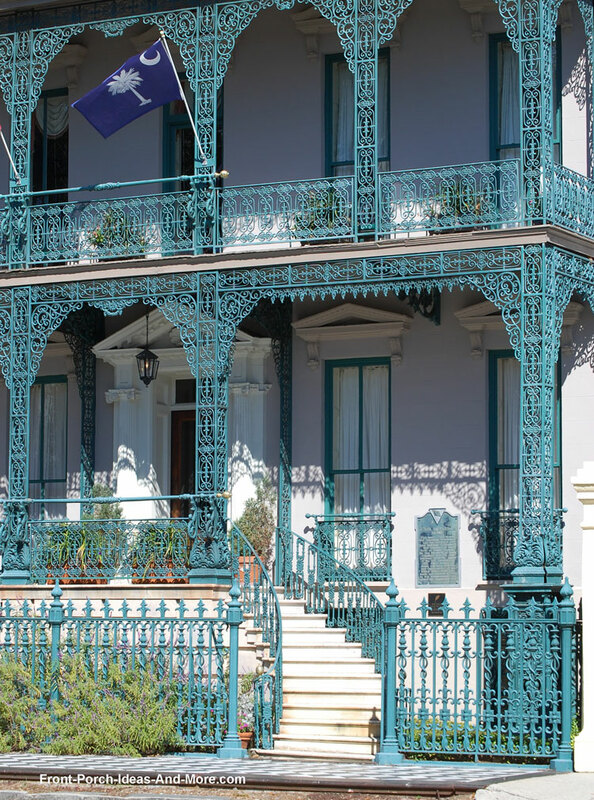 Although there aren't too many true wrought iron railings (most are made from other metals), wrought iron does add an element of elegance to a home. This unique material can be made into almost any design, from the very simple to the most ornate. Outdoor Hand Rails: Do Yours Meet General Code Requirements? Many hand rail systems, some pre-assembled, are designed to ensure these requirements are met. 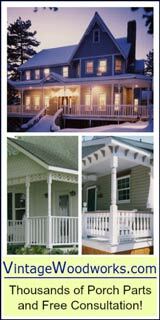 Choosing the right system can make building your porch hand rails easy and save you money as well. It is imperative you check with your local building codes department to obtain the specific requirements for hand rails in your community before you build. Please do that. Here's a list of general building codes you can use to check with your local codes department. Round hand rails must have a minimum width of 1 1/4 and a maximum of 2 inches in diameter. Rectangular shaped handrails must measure between 4 inches and 6.25 inches. Oblong handrails must measure no more than 2 1/4 inches across the widest part of the rail. Must be able to bear at least 200 pounds of weight. This applies to your entire railing system to include the stair hand rails. Must be at least 30 inches but not more than 37 inches to the top of the hand rail as measured from vertically from the nose(front)of the stair tread. NOTE: In Nashville, TN., the building code is a "grip able" handrail that is not less than 34 inches and not more than 38 inches. Stairways with four or more risers or stairs that rise more than 30 inches in height must have at least one handrail. We recommend you install hand rails no matter how many steps you have. A minimum of 1.5 inches is usually required between the handrail and another object like a post or wall. Handrails should be continuous for the full length of the stairs. Stair stringers must be secured at the landing. Please check with your local building codes department to obtain specific requirements for your area.